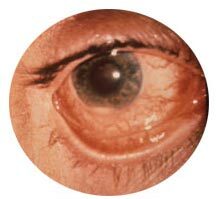 Endophthalmitis is a serious infection that involves the inside of the eye. Most commonly, it is a bacterial infection which occurs following eye surgery or other eye procedures where the eye is entered. It is an uncommon disorder occurring in less than one in a thousand surgeries. It can happen after an otherwise uneventful surgery. There is a higher risk of endophthalmitis following an injury to the eye when the eye is opened and requires surgical repair (about one in 20). Rarely, endophthalmitis can occur from bacteria or fungus which travels to the eye through the bloodstream. This can occur when someone is very ill with bacterial sepsis or when someone has an infected indwelling catheter or heart valve. Symptoms of endophthalmitis are decreased vision, eye pain, increasing eye redness, and floaters. Not all of these symptoms are present in every patient, and early detection is important in saving the eye. The diagnosis can only be made with a good eye exam. Anyone having these symptoms and who has had eye surgery, particularly recent eye surgery, should contact their ophthalmologist immediately. Usually once endophthalmitis is diagnosed, a referral is made to a retinal specialist. Retinal specialists have special training in this disease, and have experience in treating it. The treatment of endophthalmitis involves obtaining a sample of the fluid from the inside of the eye to help determine the source of infection. Injections of antibiotics into the eye are performed concurrently. Topical and often oral antibiotics are used afterward. With the most severe of infections, surgery is required to help decrease the amount of bacteria and inflammation in the eye. The organisms which cause endophthalmitis can cause serious damage to the retina and can even lead to blindness. Even once the infection clears following successful treatment, vision can be blurred permanently. The outcome largely depends on what organism was involved in the infection, and some people regain good vision. Recovery can take weeks to months.